On 25/11/2016, the Institute of Osteopathy presented awards during their gala dinner. The panel that voted for the awards was composed of Prof. Dawn Carnes, NCOR director, Charles Hunt, BSO Principal and chief executive, Maurice J Hills, Osteopathic Education Foundation executive secretary, Maurice Cheng, Institute of Osteopathy chief executive, and Tim Walker, GOsC chief executive and registrar. 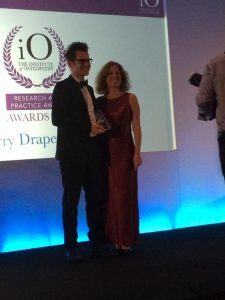 Dr Jerry Draper-Rodi was presented with the Research in practice award. Jerry was awarded for the work he did towards his professional doctorate in osteopathy that he completed in 2016. The professional doctorate is run in conjunction between the BSO and the University of Bedfordshire. His research supervisors were Steven Vogel (Vice-principal Research at the BSO) and Dr Annette Bishop (NIHR Research Fellow at Keele University). Jerry’s research was on the biopsychosocial management of patients with low back pain. After reviewing the literature, he developed an e-learning programme and then conducted a mixed methods feasibility study using the e-learning as a form of CPD for experienced osteopaths. Jerry is an advocate of embracing research in practice and informing research from practice. His research was on the dissemination of research findings to clinicians. Learning from practice and knowing what osteopaths do are also at the heart of his research interests: he has been using the PROM app from NCOR for nearly over a year now. This research allows collecting data anonymously and to build up evidence for osteopathy and learn what we are doing well and where we can improve. Jerry has just been offered a position within the research team and has CPD manager at the BSO. He is really exciting to start this new adventure at the BSO! « Why do your knuckles pop?